I graduated from veterinary school in 1934. I had a job offer to work in Australia but my mother made it clear she was against me taking it. She feared she would never see me again. I saw an advertisement for a meat inspector job in a slaughterhouse in Secaucus, New Jersey. It was the only other job available to me. I was able to avoid being drafted into the army because they needed large animal practitioners to do meat inspection work. I was licensed to be a state meat inspector and for doing intra state inspections for New Jersey and Pennsylvania.The owner of the slaughterhouse was a Jewish fellow who was looking for a friendly guy, someone who would conform to his way of thinking. He was not happy that I was a believer in strict inspection. His business depended on crippled animals. Cripples require special inspection; otherwise they could not be sold and would have to be destroyed. It is a dirty business. They were always cutting corners to get animals through inspection. One time they ran the animals through on a Jewish holiday when they knew I was not going to be available to inspect them. Somebody squealed. Otherwise, how would I have known? I also got a job doing meat inspection work in another slaughterhouse in nearby Carteret, New Jersey. While doing meat inspection was a full time job I wasn't that busy and had plenty of time to start a private practice on the side. When I came to Secaucus I was entering a territory that had been served by Dr. Emerson. I knew it would take time to gain the confidence of people who had used my competitor as their veterinarian. He extended credit, which I was not able to do. In large animal work the large serum companies require that you pay for the serum you buy within ten days or they would not sell you any more serum. I didn't have the money to extend credit until the farmers sold their hogs and paid me. If I couldn't give credit I couldn't get the work. I didn't realize there were actually two Dr. John Emersons - father and son. The father did the large animal work and the son had a small animal practice on the Boulevard in Union City, New Jersey. So I was competing against two men but I didn't know it. When one of Emerson's clients had a problem and was not getting results he would call me. Sometimes there was an outbreak and Emerson wouldn't come so they called me. That is how I started building my clientele in Secaucus. I would work for one guy, and he would recommend me to a farmer two doors down. My practice grew very slowly. They had been dealing with the old man for years and there was a certain amount of loyalty. They only called me when there was trouble. I worked for the Kastner family. These two brothers ran competing farms. After I did a good job for one he told his brother and then he called me too. It takes time to build a practice. I was fortunate that I was always busy right from the beginning so I started making money. I drove an old two-passenger car that the farmers recognized. I couldn't afford to give credit but I would juggle and take payment from one guy to pay for the serum of the previous customer. If a farmer sold his hogs within ten days and could pay me I was all right. Luckily I was single and did not have much in the way of expenses. I lived at 290 Born Street in Secaucus. Mrs. Wolf, a widow, depended on the income from renting out rooms in her house. She wanted to give me room and board but I couldn't fix the time when I could regularly eat. Every once in a while I would get a call there - Mrs. Wolf's oldest son would answer the phone. I would go to wherever the animal was. After work on Friday I would drive to Philadelphia where I would spend the weekends with my folks at 290 Clearfield Street, where they had the grocery store and were starving to death. As I started to have an income I was able to help my parents fix up their place. On the weekends I would go out with my friends, Mike Meyerwitz, Len Sherman, and Phil Spivack (my future wife's cousin). One of us would arrange dates for the others. We would go to a movie for $1.10 per person, which was expensive. One of us would call a girl we knew who would arrange for some of her friends to join us in a group - four girls and four guys. Phil never supplied any dates. Finally we told him that if he wanted to come with us he had to find the dates once in a while. So he called his cousin, Rebecca, who found the rest of the girls for that evening. That is how I met my future wife. We went to a party. While it wasn't love at first sight, from then on whenever I could I would see her on the weekends I came in to Philadelphia. 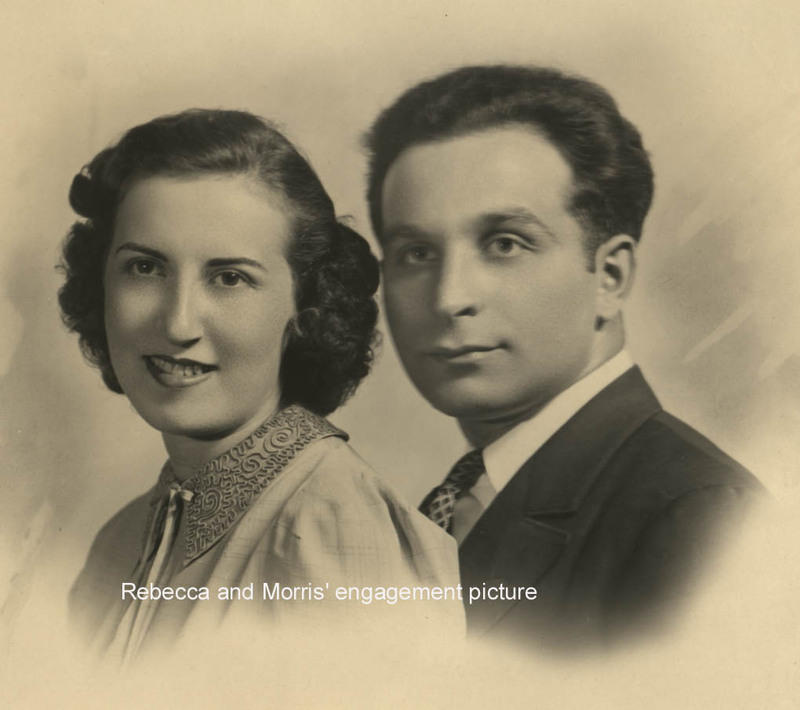 After years of living in Secaucus and traveling to Philadelphia to see Rebecca, we got married in 1938. We were married in Philadelphia by a Rabbi. We scraped together the money for the rented "hall" on Broad Street. I helped pay for the wedding since times were hard and I was the one who was working and had the money. At $25 per person with at least fifty people in attendance, it amounted to a lot of money. My parents had a lot of their friends there. Pop invited members from the many organizations to which he belonged, such as the group that loaned money to the poor. At the reception, a representative from each group made a speech or toast, trying to outdo the other groups in presenting their gift with fanfare and pride. One group proudly announced $150, another even more. However in reality it was just scrip, and the gifts were actually in the range of $20 to $25. "Musicant", a versatile musician who played many instruments and was an authority on Jewish songs, provided the music. We went to Washington, D. C. on our honeymoon. I rented a house, 1190 Paterson Plank Road, to use as a veterinary hospital. The building originally had been used as hospital and belonged to a prosperous physician who had an office in Union City. I put up a sign on the lawn saying "veterinarian". People came in and asked, "What's a veterinarian?" I considered putting up a sign that said "animal doctor" but decided, "Let them learn what a veterinarian is." It was a big place, 14 rooms, but we could only afford to fix it up gradually. At first we only used part of it for living space, my office, and a waiting room. Rebecca did not enjoy being alone in the big old house. We got a fully-grown German Shepard. I guess I loved my boyhood dog so much I named this new dog Peggy too. She was a watchdog but had a pleasant nature and was friendly. But she looked mean and people who didn't know her were afraid of her. If you touched our car she would growl menacingly. Everyone liked Peggy, even the clients. If she knew you she would let you rub her head. I would take her on my calls. I had no difficulty getting rid of her pups whenever she had babies. One time I bawled her out because of her behavior. She was upset with me and wouldn't come near me for about a month. She lived a full life, somewhere between 14 and 18 years. I was very upset when Peggy died. We closed the hospital so we could bury her. We had Siamese cats over the years as well. A client left the first one. We enjoyed her so much we decided to keep her. She got along well with Peggy. Once I found them sleeping together. I worked all day at hog farms or doing meat inspection. Meanwhile I started to build my small animal practice. In the beginning no one came. Then, if a car hit a dog they would bring the injured animal to me, since I was right in town and they didn't want to go to Emerson's hospital. Someone would ask me, "Do you treat dogs?" They didn't realize that I treated all animals, not just large animals. My reputation grew by word of mouth. In the beginning I didn't know how much to charge. I would go to the veterinary meetings of both the New Jersey and Pennsylvania Veterinary Associations that were held in Philadelphia every few months. I would ask how much other veterinarians charged for specific procedures. I would go to the meetings to meet other veterinarians and also to find out about any job possibilities. I was always looking for new opportunities. Soon I was treating a lot of animals. I did not have office hours. I saw clients whenever they needed me. People would just ring the bell and come in. Our first child, Janet, was born in 1940 while we were living at 1190 Paterson Plank Road. We named Janet after my mother, Jennie. I had been especially fond of my mother; she had died earlier that year at the age of 45 of nephritis. Doctors at that time knew little about her kidney disease. The treatment she received was inadequate and ineffective; she died in the hospital. My father died in 1948, spending his last years in a nursing home. In 1941 I received a notice to report to the local Secaucus draft board. During the First World War a veterinarian had been drafted and placed in Secaucus to oversee the swine production for the military, which needed pork for the soldiers. The Draft Board offered me the opportunity to avoid being drafted by promising to stay in Secaucus for the duration of the war and supervise the swine production. So I remained in private practice and continued my large animal work with swine. I did not service all the local farmers as some still used Dr. Emerson; however, my availability in Secaucus to do large animal work kept me out of the army and the war. We moved further down the main street in Secaucus to 1250 Paterson Plank Road. We were tired of paying rent. The building we wanted was one of three that were being sold as a unit to settle an estate. I discussed my plans with a client, Mr. Griffith who then offered to loan me the money for one of the mortgages. He suggested I see Mr. Harry Grayson about borrowing the rest of the money. Harry Grayson and Mr. Griffith owned farms next door to each other. One of Mr. Grayson's adult sons, James Grayson and his family would live in a house behind us once we moved into our apartment. I was still regarded as new in town so it was not easy to borrow money. The Graysons were a large, influential family in town. It was like dealing with a bank. Years later when I was involved in starting the Secaucus National Bank in competition to the existing Trust Company of New Jersey, the Grayson family was involved. The family had a lot of investments. I remember Mr. Grayson jumping up and down on the second floor of one of the buildings I wanted to buy to see how strong the floors were. He was a shrewd guy. He gave it an inspection worthy of the Taj Mahal. I felt better when he said he would lend me the money. The loan was through James' sister-in-law, Ethyl. In effect the Grayson family was taking back the mortgage for property they owned. I only got the loan because Mr. Griffith had vouched for me. There were businesses on the first floor of the buildings including a dry cleaner and a saloon. I don't like saloons and I wasn't going to rent to them. But I learned that a saloon license is a valuable asset. I never had any trouble with my tenants. Otto Mack, the undertaker, was a tenant but he wanted his own place and moved across the street. The apartments upstairs from the stores rented for $40 a month. The income was enough to pay off the mortgage. In retrospect buying all three buildings was fortuitous. The other two buildings produced an annual income of approximately $3,800 to $4,800 per building and paid for themselves over time. I remember a man coming to my office wanting me to look at his horse. Where was the horse? He had brought it around to the back of the hospital. The original animal hospital was in the form of a railroad apartment. You entered the waiting room. The next room was my office and examining room where I saw patients. Behind the office were the kennels. You could exit the building from the kennels. There was a book and movie, All Things Small and Beautiful, which described a veterinarian with a practice exactly like mine. Originally my practice was large animal. I dealt primarily with hogs, but also treated cows and horses. Sometimes I would come home from work on the farms and find two or three small animal patients waiting for me. We started with a fee of $2.00 and then we raised the rates to $3.00 per visit. We lived in a large apartment above my office. After we had been there a while I bought a big chicken coop, had it cut in half, and moved it behind the buildings we owned. We used the old coop for garages. I parked our car in one and rented the other one just to keep it occupied. Our second child, Jerry, was born in 1943, and Carol, our third child in 1946. All three of my children were good children. They never were any problem. They were obedient and smart and everybody envied them. Why? Because they had such wonderful parents. They were normal children with normal problems. My wife Rebecca was the primary caregiver. In addition she assisted me with my veterinary practice. Rebecca answered the phone during the day while I was out doing large animal work and scheduled my appointments. She served as my assistant when I did small animal surgery. When the children got a bit older she assisted me during evening office hours. I would see small animal patients whenever I could fit them in until I was able to give up some of the large animal work and set up regular office hours. I gradually cut back the large animal work to what I could do between my small animal office hours. Large animal work took too much time. A large animal call could be out in Nutley, New Jersey or someplace that took a while to get to. Eventually I built up my small animal practice so I no longer relied on the large animal practice. Many of our friends were veterinarians who lived in nearby communities. Being Jewish in a non-Jewish town meant it was hard to fit in socially. It wasn't that easy to break into the social life of the community where we were members of such a minority. The Jewish families in Secaucus all knew each other. A few of us saw the need for a shul, or temple. As I remember it, we found a neglected meeting room, an abandoned garage that was being sold at a sheriff's sale. About ten people from the seven Jewish families in town came to a meeting. The group organized to raise the three thousand dollars to buy the one room building. Then a local radio station was going to tear down their building and build a new station. We arranged to move the building to our property. The women ran cake sales and got donations from whomever they could. They would the owner of a store to give, for example a dozen stockings. Then they would have a sale of these objects to raise the money. I became the first president of the schul and remained president for several years. One of the main workers in our tiny Jewish community was Mr. Feldman, who owned a candy store. Mr. Feldman had relatives, the Cantor's who lived on the street where the shul was located. It helped that the town did not charge us taxes since we were creating a religious institution. We had low overhead. We let non-Jewish groups use our building for meetings. A few years after we had acquired the schul Feldman telephoned to tell me, "There is a fire at the schul." "Call the police or the fire department," I said. "No let it burn," he suggested. "Then we can get the insurance to fix it up." That is what happened. We got something like $500 from the insurance and we repaired the property. I was not religious, but I always was proud of my religious heritage. I observed the religious high holidays. My Jewish identity included the unspoken expectation that we would marry within the faith. I got involved with the shul because I wanted my children to be aware of their religious heritage. We had no place in Secaucus to provide my children religious training so we took them to a synagogue in Hoboken, New Jersey on Sundays for religious training. Later when they were adults and married non-Jews I accepted it. It was not an issue for me. I was a member of Kiwanis, a local men's civic group. I was president for about six years, I think, during the 50's, and as the program chairman I had to get people to come and speak to the group. Our club was a relatively small club but we had excellent attendance at meetings. Members from other clubs would come to see why we were so successful. The key was having a lot of programs that would attract members. I would get speakers as a favor to the club and me. For example, for fire prevention week we got the local fire captains. Apparently no one had ever thought of doing that. The Kiwanis was a social activity for me. I made a lot of acquaintances, both in Secaucus and in other local Kiwanis groups such as North Bergen. I enjoyed meeting people and making contacts. However Mom and I didn't socialize with these people outside of club activities. Even after I stopped being active I would still go to meetings on occasion, such as past Presidents night. I was also involved in Veterinary Associations. I was nominated to serve as an officer but I was too busy and too tired to play a more active role in those organizations. I was also a member of the local Mason's group, which was a secret society. I contributed money towards the worthy causes the group sponsored. I reached the 32nd step (out of 33) but I was not particularly active. I also supported the local Boy Scouts, and served on their entrance committee, but was not active nor a scoutmaster. I always preferred to own automobiles made by Chrysler. The first old Dodge I owned had an emblem on the radiator with a design in the form of a Jewish star. When I sold the original Dodge I transferred this emblem to the next Dodge I bought. There was a time I owned a Jeep, which was useful when I went to work on the pig farms. We owned a big blue '49 Chrysler and then we got a used large white '57 Chrysler with huge fins. We painted it mint green. Subsequently we owned other Chrysler sedans. My children joked that I always chose blue cars. I surprised them with the most recent car we bought in the 1990's, and the last car I would drive - a maroon Chrysler four-door sedan.